Happy Tết, or Lunar New Year. My wife celebrated by talking about Tết at The Boy's school, complete with a book, Tết treats (dumplings and shrimp chips), miniature cream puffs (homemade), and little red envelopes filled with lucky candy. 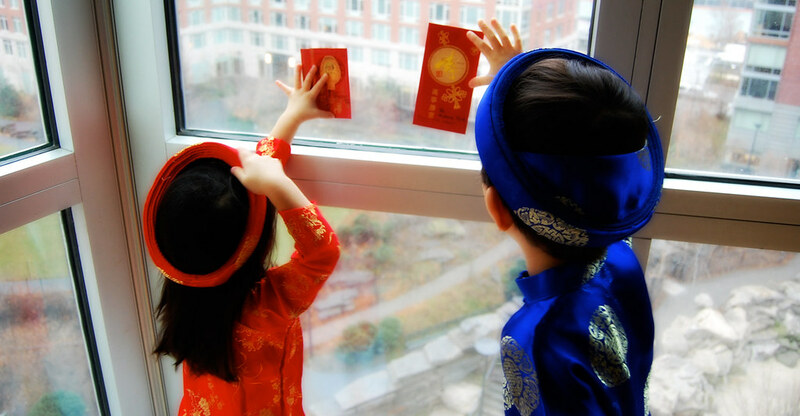 Q came too dressed in her red áo dài (pictured above along with The Boy in his — at least for pictures at home). As usual, Q's favorite part of visiting The Boy's school was getting to wash the dishes. Many customary wishes accompany this holiday. I'll pass along my favorite: May a myriad things go according to your will. Here's to the Year of the Rat being a good one.